Famous people born on OCTOBER 18 are good looking! These Librans look better and more attractive over time. They normally take their health seriously. It’s likely they will be turning heads long into their retirement years. They purposely dress to impress but mainly it’s for themselves… it’s how they are. They have an unique way of making people feel extraordinary. When it comes to friends, famous October 18 celebrities make a wise selection. However, they are a bit different from each other. Their private time is spent with that someone special. They enjoy the intimate moments where it’s just the two of them and their imaginations or when they are discussing their plans for the future. They are typically a planner and live within a certain and set amount of money each month. They’re determined to not have any financial stresses or strains. Their skills could land them a top position as engineer or drafting/design person. If that doesn’t interest them, then a career in education would make an excellent alternative choice. 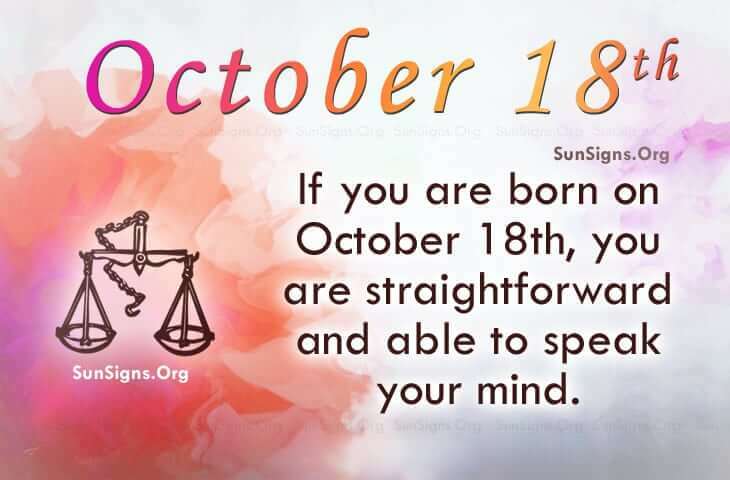 Famous people born on OCTOBER 18th are likely to be able to speak their mind. Generally, straightforward, they are selective when it comes to their friends and lovers. As a rule, people like them but they may not be able to manage their money.